Daylan Stephens, a student in our 2017 long Fairy Tale course, created these wonderful fairy godmother paper dolls! She has graciously allowed us to post them here for you to print, cut out, and even color if you’d like! Simply click on each picture to access the accompanying PDF file. Fig. 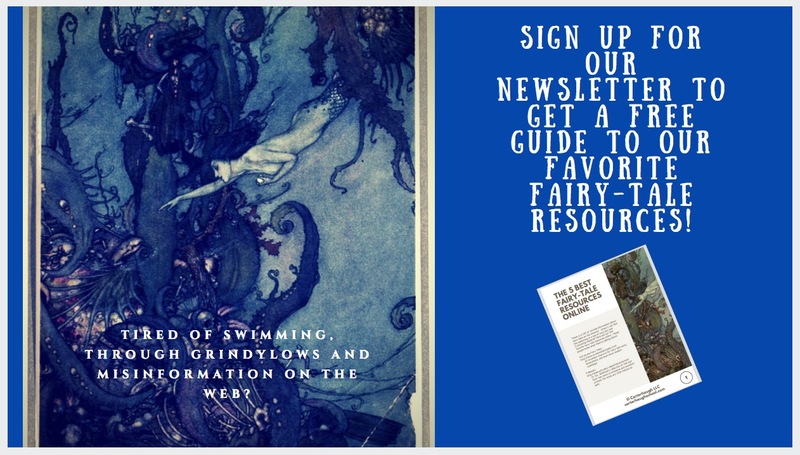 1 – “Toads and Diamonds” – taken from Perrault and entitled “The Fairies” – The fairy is a fairy godmother-type, for she rewards the good girl by having diamonds and flowers come out of her mouth. The bad girl has toads and vipers come out of her mouth when she talks. This is why the diamond shape figures in the fairy’s clothes, why she is holding a toad, and why she has lily pads at the top of her dress. Fig. 2 – Perrault version of “Cinderella” – Since it’s Perrault’s version, which has the pumpkin coach, the dress looks like a pumpkin. Fig. 3 – Grimm version of “Cinderella” – Although there is no fairy godmother in the Grimm version, I like to think that Cinderella’s mother was a fairy, and that’s how she was able to come back in spirit (possibly bird form?) and haunt the tree. Also, I thought that she might be a fairy because her spirit haunts specifically a hazel tree, which was considered sacred to the fairies (“Fairy Tree”). That is why hazel tree leaves appear so much in her dress. She holds a little bird, since that acted as a fairy godmother in the story. Fig. 4 – “Sleeping Beauty” – In Perrault’s version, the fairy rides a chariot pulled by dragons; hence, the style of wings and motif in the dress, as well as the flames going down the dress. She is holding a spinning distaff because (besides the curse on the princess) that alludes to the Scandinavian medieval sagas in which the enchantress uses not a wand, but a spinning distaff (Lionarons 286-287). In the Norse stories, spinning is associated with magic, and that is associated with the Norse Norns, who would spin the threads of people’s lives/fate. Also, the Norse stories depict three Norns attending children’s births to declare aspects of their future –much like the fairies at the princess’s christening (Lionarons 284). The Greek motif at the bottom of the dress alludes to the Greek version of the Norns, the Fates, and the Quarrel of the Ancients and Moderns, of which Perrault was a part (Windling). Fig. 5 – It was the fashion in mid-late 17th century France to wear masks, which I thought is perfect for “Beauty and the Beast” and “Donkeyskin.” Both stories involve disguises and transformations. It was fashionable to use fur muffs, too, so I included that to allude to the beast’s fur. The rose (of course) is for “Beauty and the Beast.” The starry cloak alludes to the starry dress in Donkeyskin. Fig. 6- Tuscan and Chinese “Cinderella” – Although there’s no fairy godmother in the Chinese version, I thought the golden fish acts as one. The feathers represent the fairy godmother-like bird in the Tuscan version of “Cinderella.” The Tuscan version does not indicate the type of bird, so I made the feathers all blue due to the concept of the Bluebird of Happiness and the fairy tale of “The Bluebird” by D’Aulnoy.